Constructed in the Early Tang and renovated in the Five Dynasties, this is a small hall cave with a truncated pyramidal ceiling. There is a niche with double recesses dug out of the west wall, containing a seven-stuccoed figures; a Buddha, two disciples, two bodhisattvas and two heavenly kings. The heavenly kings have features of a non-Chinese foreigner; high nose bridges, thick eyebrows and big eyes. The ceiling center has a pattern of twisted vines. The drapery around the center extends to the four slopes. The decorative borders of twisted vines connect the the four walls with the four slopes. There is a preaching scene of Maitreya in the center of the south wall, which is surrouded by the thousand Buddha motifs. The north wall presents an illustration of the Amitabha sutra in the center, also surrounded by the thousand Buddha motifs. There are three preaching scenes above the entrance on the east wall. The south side of the entrance depicts a preaching scene of the Medicine Buddha, while the north has a standing disciple image with four donor figures. On either north or south of the brim of the entrance is a worshiping bodhisattva painted in the Five Dynasties. On the tent-like ceiling of the corridor in a Buddha in meditation painted in the Five Dynasties. On both of the north and south walls of the corridor are covered with the Buddhas in meditation, only two has survived on each side walls. There are three preaching scenes on the space above the entrance in the east wall. on the south side is a preaching scene of the Medicine Buddha, who holds a staff in his right hand and a medicine bowl in his left hand. He wears a kasaya with dense folds which covers his two shoulders. The bodhisattvas on either side of the Medicine Buddha wear a crown with a sun and moon discs. Their upper bodies are naked and their lower bodies are tightly wrapped in long skirts. Below the Buddha are two donor figures seated face to face with an inscription in the middle, some words of which are still visible. To either side of the door frame is a worshipping bodhisattva of the Five Dynasties. 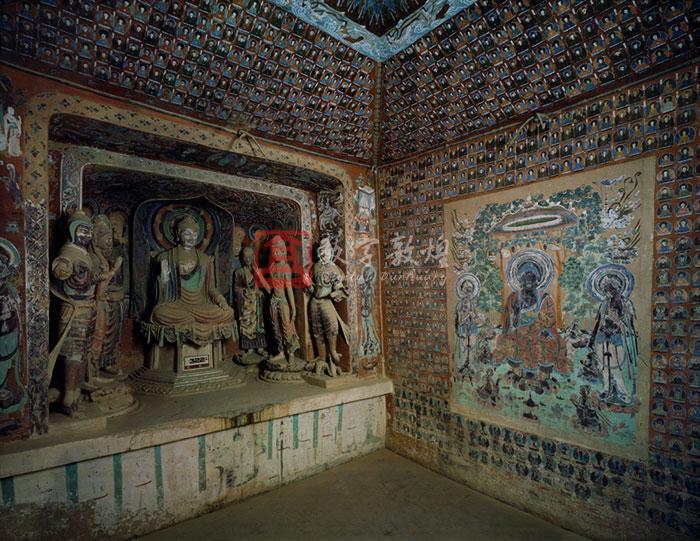 The south wall is covered with the thousand Buddha motifs, in the middle of which is a preaching scene of Maitreya in kasaya with both shoulders covered, both hands in Dharmachakra-Mudra. on either side of Maitreya are three bodhisattvas, one of which holds a transparent bowl. Below them are two worshiping bodhisattvas. There are four apsaras altogether on the sides of the parasols. The upper two wear a long skirt and fly with flowers in hand. The two child-like apsaras wear a pair of short pants and fly with arms and legs widely extended. The west niche in the main chamber has a group of seven statues, including the central Buddha, two disciples, two bodhisattvas, and two heavenly kings. There are ten apsaras on the ceiling of the inner niche. The central Buddha is against the west wall, on either side of the Buddha are disciples, below them, Mrgasirsa is painted below on the south sdie and Vasistha on the north (obliterated by people with earth red color in later times). The south wall has two disciples and an incarnated child. The north one has two disciples. The outside recess of the niche has a Buddha seated in meditation in the center, flanked by two disciples and auspicious beasts. The south wall is covered with the painting of the Great Departure while the north has the scene of the Conception. The inner layer of the niche border is decorated with twisted wines and lozenge flowers. The north wall is covered with the thousand Buddha motifs. In the middle of the north wall is an illustration of Amitabha seated in meditation. Amitabha is flanked by Mahasthamaprapta wearing a bottle like crown and Avalokitesvara whose crown has an image of an incarnated Buddha image. On the upper part of either side of the preaching scene are three apsaras holding scepters in hand and flying down on the clouds. There are also musical instruments in the sky giving out wonderful music, though without a performer. At the lower part of the illustration there is a pond of seven treasures, in which six worshiping bodhisattva are sitting or kneeling on the lotuses. There are also incarnated children in the lotus pond. The ceiling center highlights a four petaled lotus formed by vines and honeysuckles with the motifs of scales and connected pearls along its outside brim. The outermost motifs are triangles and draperies. Around the center design are 16 flying apsaras. It was mainly rendered in azure and earth red. The four slopes are covered with the thousand Buddha motifs.